06338: mz2000, mz2200: Mistakes in current keyboard matrix emulation and missing keys ! 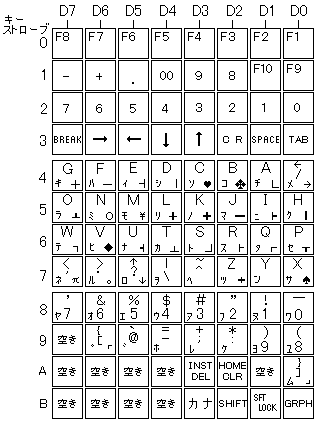 On above links you can find keyboard layouts of MZ-2000 and MZ-2200 and compare with attached MZ-80B Jpn. keyboard. the below 80B Jpn kbd-matrix could be used to repair mistakes in current mz2000 driver and to add remaining missing keys like break, kana, grph. An mistake example in the current mz2000 driver: the RVS key is not present on a MZ-2000 / 2200 (or MZ-80B Jpn version). Compare the mz2000 driver keyboard with above keyboard matrix picture, correct mistakes and add missing keys. Commit bd6801ea71b951c6006f30f61fde382f982f40d7 should fix this for 0.179. Unfortunately, very few of the fonts I tested on OS X seem to include both box drawing characters and fullwidth katakana, both of which have been added to the Japanese key names. Songti SC comes the closet, but it is one of many fonts affected by a bug (likely in the SDL OSD layer) that causes the UI to cut off the leftmost line of many characters. I just checked it on "bleeding-edge release" and now "BREAK", "KANA", "GRPH" keys work fine. Maybe would be better to set the "DEL" instead of "INSERT" key on PC to be "INST/DEL" key of emu, because the "INSERT" key is the "fast-key" when not in emu-keyboard mode, and its more intuitive !!! After making another review of the documentation for MZ series keyboards, I've decided to make that change. INST/DEL is now mapped as DEL in emulated keyboard mode, and as backspace (unshifted)/INS (shifted) in natural keyboard mode.